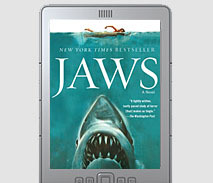 Here is the classic suspense novel of shark versus man that was made into the blockbuster Steven Spielberg movie. The Jaws phenomenon changed popular culture and inspired huge interest in sharks and the oceans. When Peter Benchley wrote Jaws in the early 1970’s, he meticulously researched all the available data about sharks. Over the ensuing decades, Benchley was actively engaged with scientists and filmmakers on expeditions around the world as they expanded their knowledge of sharks. Also during this time, there was an unprecedented upswing in the number of sharks killed for their fins to make shark fin soup, and Benchley worked with governments and non-profits to sound the alarm for shark conservation. He encouraged each new generation of Jaws fans to enjoy his riveting tale and to channel their excitement into the support and protection of these magnificent, prehistoric apex predators. The latest edition of Jaws contains bonus content from Peter Benchley’s archives, including the original typed title page for the novel, a brainstorming list of possible titles, a letter from Benchley to co-producer David Brown with honest feedback on the movie adaptation, and classic photos of the movie production.